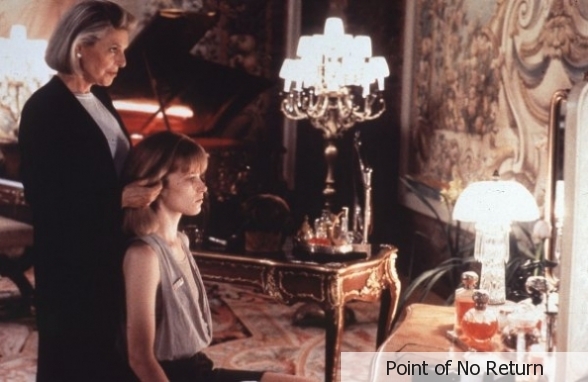 "Point of No Return" (1993). 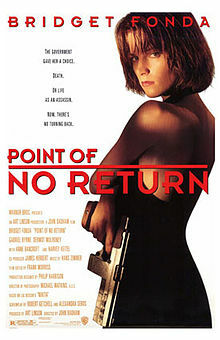 Bridget Fonda stars in John Badham's "Point of No Return" (1993). Bridget starred in a series of films in the early 1990s, working very hard to churn out three or four a year throughout the decade. Fonda had a good run of success that ended abruptly in the early 2000s when she retired to raise her family. Specializing in playing pretty young things that had weird things happen to them and/or weird characters around them, such as in "Singles" and (my personal favorite of hers) "Single White Female," Bridget could still probably return to her career if it so suited her. Apparently, it does not suit her, and that is fine. Bridget Fonda works hard to fulfill the demands of the role. "Point of No Return" was typical of Bridget's starring roles. She plays Maggie, an innocent young lady, very innocent-looking indeed. She is forced to confront a difficult situation and become an assassin. That "Point of No Return" - projected to be the start of a franchise - failed at the box office really wasn't Bridget's fault, but it certainly did not help that she was mis-cast. Making an immediate remake of the remarkable French original was the bigger mistake, but the fact that Bridget did not project the inherent edge of toughness that was ther character's essence put the final nail in the project's coffin. People still wonder why this film had problems, but in my humble view, to anyone who had seen the French original, this film looked stilted and forced. Just putting any pretty girl in the lead role wouldn't automatically work. The role required a woman who projected strength and authority. Bridget projected neither, and the innocence and fragility that she actually did project ruined this project. Bridget was fine as a girlfriend or just a friend, but a hardened hit woman? Please! Handler Gabriel Byrne gifts Maggie with an elegant pistol. Girls with guns! Girls with really, really big guns! That's what this is all about. It is good for what it is, but everybody in it has done better work elsewhere. If you want to see Bridget Fonda, go see "Single White Female," in which she is stellar. Harvey Keitel? Go see just about anything else he has done (start with "The Bad Lieutenant"). If you want this tale told better, go see the French original ("La Femme Nikita"). Seriously, the French version is better. But, for what it is, this is an OK film. Maybe if you give her a REALLY BIG gun, people will be impressed? I saw the original when they were giving away free tickets in NYC to drum up interest. I thought it was good, not the best movie ever made but original and very, well, French. It had obvious flaws but was a serious film. 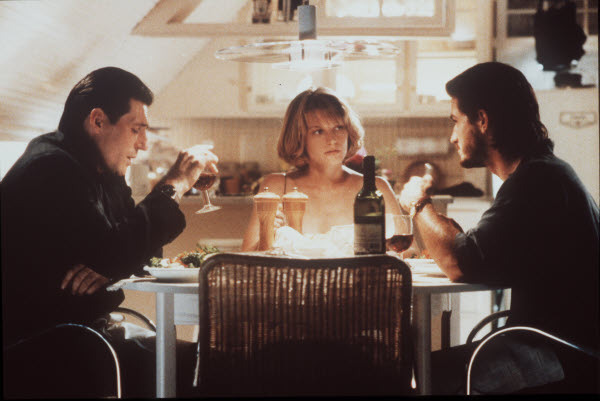 Bridget Fonda, Dermot Mulroney and Gabriel Byrne. This movie obviously is a frame-by-frame copy of the original French version, "La Femme Nikita." Somebody apparently figured that the idea of the original was great, but it needed more money, bigger stars, better scenery, and, well, more English in order to make the big bucks in the American market. There was no other reason to make this film except to make the plot accessible to American audiences. I suppose it succeeded at that crass goal, but failed at improving on the original in every other respect. Bridget Fonda doing her best to look serious. Some people here rave about Bridget Fonda's performance, but I was under-awed. Her performance in my opinion is uneven, inconsistent, and erratic. She occasionally hits the right note of a remorseless killer in a cartoon-like fashion, but just as often or more so does a good impersonation of a spoiled rich girl who is having a temper tantrum or just a really bad hair day. I won't even get into the implausibility of her character's sudden transformation about halfway through the film. Her performance makes or breaks the movie, and doesn't make it for me. Maybe if we do her hair just right, she'll look tough? OK, so "Point of No Return" has major problems. Is it worth seeing? Well, it is visually stunning, especially in comparison with the original. They obviously had big bucks to blow in making this one. Fonda looks great throughout - her fashion-girl looks not really meshing with her character, but that just shows that image is everything in Hollywood, not substance. This is the Bridget everyone sees, guns or no guns - young and innocent. Gabriel Byrne does his best as Maggie's "handler," but his character is seems mixed up about his motivations and goals. Dermot Mulroney is kind of wasted as Maggie's boyfriend. I think he is much better in later films such as "The Wedding Date" than he is here, but he does his best and does project a youthful air. Harvey Keitel does his usual competent job and turned his character of the "cleaner" into practically a cottage industry in subsequent films (for instance, in the following year's "Pulp Fiction"). Pretty much all the acting suffers in comparison with that in the original, but everyone here has the usual Hollywood competence. It is the difference between a talented artist taking a blank canvas and painting a watercolor of a sunset over the ocean, and another taking a camera - both capture the moment, but the former demonstrates inspiration whereas the latter reflects precision and accuracy. Let's say something nice about the film. "Point of No Return" is beautiful. I can't deny it. The cinematography is stunning. In visual effects, it is to the original as "Dynasty" is to "Sanford and Son" - just more polished, more refined, with fewer rough edges. "Point of No Return" has great shots of gorgeous hotels and well-dressed people and fancy settings and good shots of Fonda's (very lightly clothed) assets (which the camera is careful to showcase and linger on lovingly). However, it also has completely implausible scenes (everyone in a hotel dining room turns out to be armed with rocket launchers and Uzis and the like after the Fonda character does a job there) and characters that make no sense and have emotions like those in nobody I've ever known. I also found the background music overbearing, with welling tones striving to create false emotional highs in a very obnoxious way. I saw both films during their original runs, "La Femme Nikita" and "Point of No Return," and have very definite views on which is superior. If you like films with cartoon characterizations and no soul that look great and feature pretty girls waving big guns, this one's for you. If you want a serious film that has a real emotional payoff and some dynamite inspiration, see the original and suffer through the subtitles. Just as comparison, below is a scene from the original film, "La Femme Nikita."